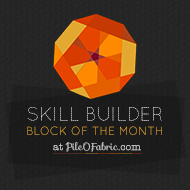 One advantage to coming into this "Block of the Month" series when it was over half published is that I don't have to wait so long for the next block. 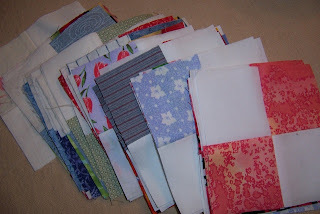 I am being "good" -and trying to do these in order - and to limit myself to one per sewing session. Block #9 comes out in March, which is only a few days away - but then it is a long wait for April, May and June... Possibly another reason why I have not done one of these before? I have never been known for my patience. 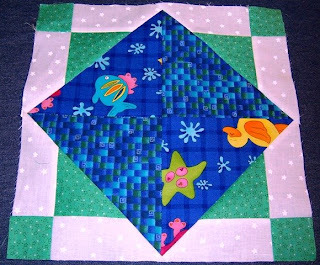 I found the 2nd block easier than the first - perhaps because there were similar elements in the construction that were easier the 2nd time around - and because a color plan - albeit a loosely developed one -is starting to come together out of my assortment of scraps and FQ's and odds and ends. 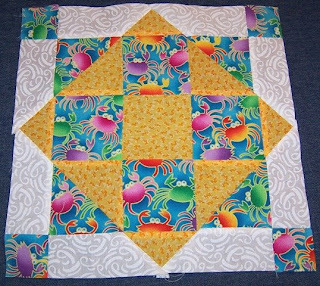 Today's block is called "Lincoln Logs" - but somehow I don't thing they have many crabs in Illinois? Hmmm -maybe "Crab Rolls" instead??? All these little bits will make this a really special quilt for the Munchkin! 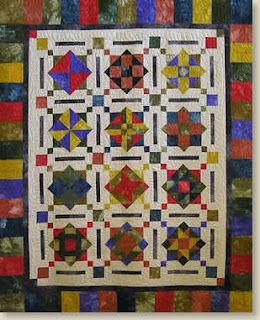 Lazy Sister Sue talked me into a Block of the Month project that her quilt guild in South Carolina is doing. Even though I can't share with them in person, she and I thought it would be fun for me to "play along." Believe it or not - this is the first BOM quilt I have ever made - I have looked at these types of projects before, but just was not at that stage in my quilting to get one going. This time the timing just felt right. As much as I like the fabric set used for this pattern, I really could not justify buying more fabrics and I had decided to do this quilt all out of my scraps - and had some more feminine fabrics in mind - mostly rose, pink and green. Unfortunately there just was not enough of them. Then my eye lit on to my teal/aqua/blues/greens and a few yellows/batiks. There is enough fabric there - and I thought it would make a fun quilt for the Munchkin (plus use some of my Turtle fabrics). I am not sure I entirely enjoy the BOM concept - I am a "cut the whole quilt out at once" kind of gal, and this cutting bit by bit, every block different, keeping track of which block gets which pieces and having pieces leftover for the borders is a bit frustrating for me - especially since I am substituting such different fabrics from the original. In this block I really should have looked for a bit more contrast between the big triangles (this is the block in the top left of the full quilt shown above) - but I still think it will work in the overall scheme of things (and the turtles from the "splat" fabric got fussy cut to show up in the outer borders). The other thing about BOM's is the waiting - luckily for me Lazy Sister Sue told me about this particular project when Nancy Rink already had 7 months worth posted -now she has 8 - so I really won't have to wait long. They are also nice BIG blocks (12" finished) so this quilt will be a good size and go together fairly quickly. 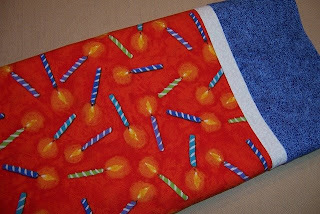 This is what was in the Birthday pocket for today - a birthday pillowcase for sweet birthday dreams. Hubby and the Munchkin got them, too. 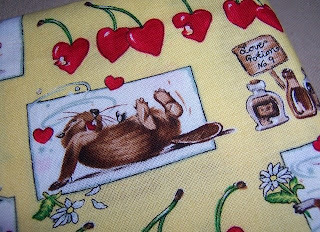 These themed pillowcases are just so much fun! This morning my son gave me the sunrise for my birthday. It all started yesterday when we had a little bathroom aiming mishap, if you know what I mean. The shower curtain, tub mat and bath rug all ended up in the wash, leaving us with only the clear shower curtain liner. This morning, rather than seeing that the shower curtain was missing, I was able to see through the clear liner, past the water spots and soap scum, and through the window to catch the most glorious sunrise. An orange and raspberry sherbet colored sunrise - glowing bright and kissing the beautiful spreading branches of our black walnut tree. A sunrise that I would have missed had that shower curtain been there. A glimpse of the sun on what is turning out now to be a cloudy and snowy day. Thanks Munchkin! Thanks for the best birthday morning!!! Yup - today's the big day! 42. The answer to life the universe and everything. At least according to some people. I am not so sure it is the answer - I am not sure I have even figured out the question yet. According to my son, however - today is HIS birthday - mine is not until Sunday in his method of counting things. 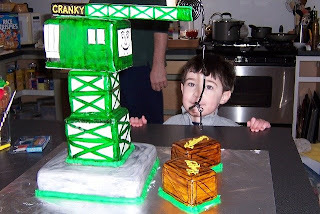 He is the smallest, so his birthday comes first - then mine - then Daddy's because he is the biggest. I wonder if that means I get all his presents on Sunday? Or if he gets my Mary Poppins 45th Anniversary DVD and my bag of Cherry Cordial Hershey's Kisses??? I have been meaning to post a photo of this quilt for a while, and a recent conversation with some friends over Japanese themed quilt ideas prompted me to finally get the photo taken and share this quilt with everyone. I can't take credit for this one - this was a gift to me shortly before leaving Japan in 1993. It was presented to me by a friend of a friend - and when I saw the amount of hand work that went into this quilt I was floored. I knew the artist - but not well - and her generosity with this gift blew me away. The noshi ribbons are all hand appliqued. The ties are all hand embroidery. 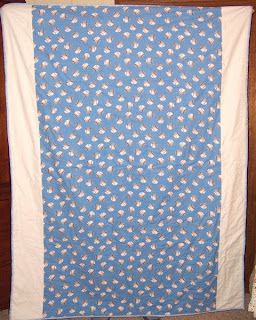 The piecing I believe is hand done - and the quilting is all by hand as well. "Noshi" is said to have been a contracted word for "noshi-awabi", which is made by shaving a shelled awabi (abalone) into ribbons and drying them in the sun. Since a long time ago, though we cannot clearly tell when it takes its rise, Japan has had a custom of attaching "noshi-awabi" when people send gifts or congratulatory presents to others. The reason for attaching a noshi was, according to some folklore researchers, to symbolize the immunity to evil things: the sender's pure mind and the harmlessness of the gift. In the past, Japanese people seldom ate animal products and even avoided them on sorrowful occasions such as mourning. Animal products were associated with the happy events, and as a representative of them, noshi-awabi, once perceived as "the best gift", were attached to the gift they send to show their goodwill. In addition, there is a legend that awabi provides perpetual youth and longevity. That might have also affected the rise of this custom. Today, the original significance of noshi-awabi has been lost, but the custom survives. A typical noshi is composed of a narrow piece of yellow paper, which is a substitute for noshi-awabi, folded in a special way in a piece of white-and-red paper to form a hexagon. Very often, noshi is replaced by a "noshi-gami", a piece of paper on which an image of noshi is printed, or the word "no-shi" in hiragana (the Japanese syllabary) are printed. We use a noshi for a happy event, not for a sorrowful one, just as in the past. Hubby and I are unpredictable when it comes to Valentine's Day. Sometimes we do the cards and the chocolates and the flowers and the mushy stuff - and other years we don't. 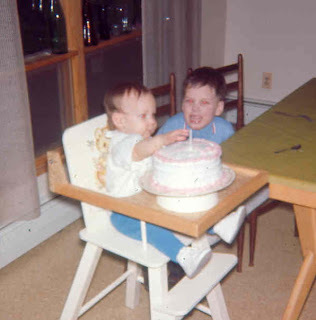 With our birthdays all right around this time, also - it gets into a lot of gift giving all at once, and we sometimes pick and choose which event to focus on. This year Hubby is making me Sausage Rolls for dinner (check Any Ideas for Dinner in the next few days as we plan to blog the recipe) and I made him pillowcases. And true to my resolution of stash busting and not buying fabric unless I really really need it, these were made from fabrics on hand. 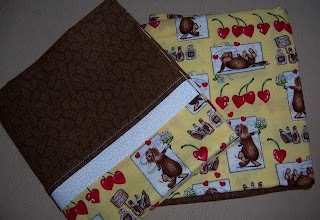 Lazy Sister Sue had given me the beaver fabric a few years back, since Hubby has a beaver collection (it's a Boy Scout Woodbadge thing) and until she shared her pillowcase pattern with me I never quite knew how to use it. It was not big enough to use as a quilt back, and I was afraid that piecing it into a quilt top would be difficult due to the nature of the print. Hubby would not want to carry a tote bag or lunch bag from this fabric, and as it is a little frilly, I figured it would need to be something we use at home. The pillowcases were perfect, and Hubby loves them. 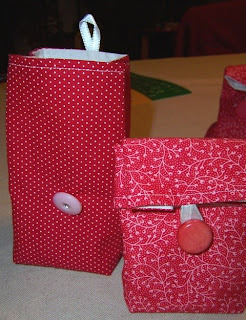 Wanting to do something a little different for Valentine's Day AND do a little stash busting at the same time, I decided to take this pattern and make some little gift bags to fill with chocolates. I made the smallest size, actually cutting it at 6 inches instead of 6.5. It was the narrowest I can go on the free arm of my sewing machine so I recommend caution on going that narrow, depending on your machine. I also made it a smidge shorter and boxed the bottom with 1.5" corners instead of 1" - resulting in a squarer bag. I was working with remnants and trying to make all the bags uniform in size, which dictated some of my cutting choices. I also used ribbon instead of bias strip for the button loops, which worked very well. I production lined 9 of these - completing everything except the buttons - in about 2 1/2 hours, which included cutting. I had never made this pattern before. I would definitely consider making these again - in a variety of sizes. 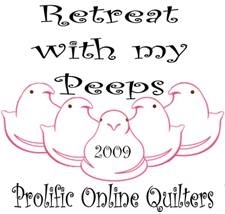 They were a great stash buster and could really show off fun fabrics. This quilt has a back story - or perhaps a "backing story", as it is one of those quilts that started with the backing fabric and grew from there. A few years ago I was assistant coordinator for a leadership training retreat for Lions Club members. The coordinator at the time was (and still is) a HUGE NY Yankees fan, from his shirts and hat and coat and other gear - right down to his NY Yankees corkscrew. During preparations for our 'hospitality' evening - I was using said corkscrew to open up the wine and ended up opening a gash in my thumb instead. In the cafuffle the corkscrew also got broken. I jokingly told him I broke it on purpose because I don't like the Yankees. 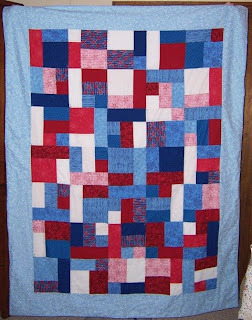 I could not find the flannels I wanted to coordinate with this one, so I decided to use it on the back and just do a red white and blue on the front - using the Yellow Brick Road pattern (again). As I am not really a baseball fan myself, and really truly not overly fond of the Yankees anyway, which is a recurring joke between the three of us - this was the closest I was willing to come to Yankee pinstripes. I had a moment of crisis on this quilt, however, when I prewashed the baseball flannel backing (which was the end of a bolt...with no more in sight) - and it SHRUNK more than was recoverable. Hence the two white borders on the sides of the backing. February is our month for birthdays, but looking at back posts from the past few years, it also seems to be our month for germs - especially for the Munchkin and I. Now that we are feeling better - things may get more interesting. I have a few handmade projects in the stash (not photographed yet, sorry...), and the birthday cake of the year has been designed - providing the Munchkin does not change his mind yet again. We have gone from a steam engine - to a diesel engine - back to a steam engine - to an alligator - to a dinosaur (T-Rex - standing NOT sleeping) - back to a steam engine - back to an alligator. Since I "design" the party theme and invitations around the cake, I finally opted to send out electronic invitations with no theme on them at all - just to hedge my bets. Somehow I am anticipating boo boo lip and tears no matter what Hubby finally comes up with. At least the germs hit us early -and perhaps will not visit again on my birthday like they did last year. The "verbal" one is at a loss for words of late - it's not that I have not been busy, because I have. It's not that interesting things have not been happening, because they have. It's just that things have not been making the transition from reality to print of late. I am supposed to be working on editing a newsletter right now - now that my sickly child is upstairs sleeping - but just can't "get verbal" on that either. Maybe I just need to eat some alphabet soup? 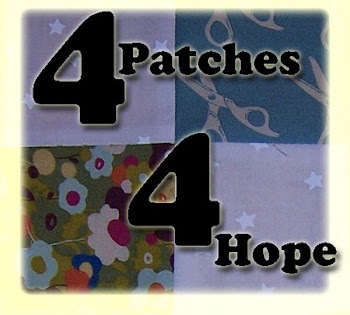 I "found" these four-patches... and I found them while I was working on another project. Last spring I got so excited about the Hobo Lunchbag, I decided to make a bunch to take to a craft show I did in December. As usual, however, I made a few changes in the construction from the original instructions. and... rather than sew the sides all the way down and then do the little "triangle trick" to box the bottom (which never seems to work consistently for me), I chose rather to cut a 3" square out of the corners of both the bag body and the lining prior to sewing, leaving me with a whole bunch of 3" squares already cut and ready to go. A little bit of chain piecing later, and I have 45 4 patches, 2 of each fabric and one extra. They range from black to blue to birthday candle print - a big variety. They measure 5" square, each is a print and a solid - either white or muslin, with the exception of one that has a "pinstripe" for the light fabric. Not sure what to do with them next - any ideas??? I've got the month pretty well planned out so that I don't make myself crazy or broke - some big stuff (thank you craigslist! ), some little stuff, some candy, some family time coupons... now to just get everyone healthy and we will be all set to go. The pockets have been on the wall for a week now because the Munchkin remembered (awww...) and wanted them up. Of course the first thing he did was go through all of them to be sure there was nothing left behind from last year! These little baskets are addicting...and flexible! 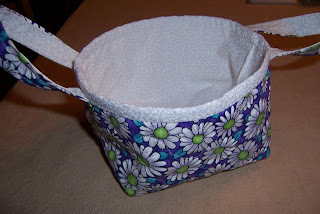 I started with this tutorial, and though I have made quite a few to the directions - this basket is very scrap friendly, but if your scraps are anything like mine -they don't always conform to the dimensions of the pattern. This time around I needed a little basket to match a criss-cross coaster I had already made, and had very little coordinating fabrics left to use. So I decided to forgo the concept of a patchwork top to the basket, and just use what I had left to make up the overall outside pieces of the basket. 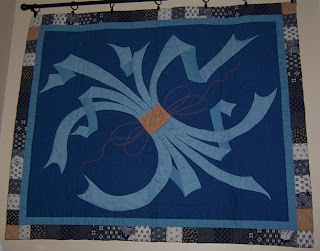 Then I decided to use it as a practice for some free motion quilting with Zoe. Then - since I could - I decided to cut the lining a bit bigger a la Lazy Girl's Miranda and give it a little bit of a peek-a-boo for some interest. Joan's great pattern also gave me the know-how to put the handles on after assembly. I think the handles ended up a bit long - but will leave them for now and let the recipient send it back for alterations if she wants. For now I am done with this basket, and already collecting the bits for my next one.